This free app is an essential tool to stay up to date about power outages, allowing you to see where interruptions are on our network and estimated restoration times. 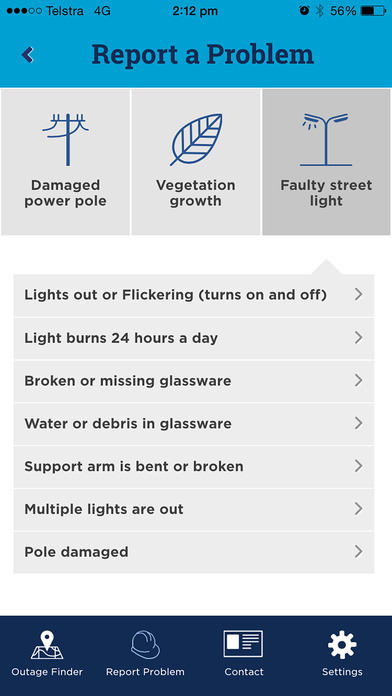 In addition, you can report issues such as damaged power poles, faulty street lights or problems with vegetation. The Ergon 24seven app is available for iPhone 5 and above. Simply search for ‘Ergon Energy’ in the Apple AppStore, download and install the app. The first time you log in, you will be required to set up an Ergon 24seven account. Simply create a new username and password and follow the steps. Alternatively, you can log in using your Facebook account. Report pole damage, faulty street lights or vegetation problems online using the app. Depending on the nature of the problem, you may be directed to our contact centre. The Ergon 24/7 app is here. It's available right now for iPhone and you can download and install from the Apple App store for free. For customers, it allows them to find a network outage near them or report a problem with the network, and Ergon staff can do the same. Installing the app is easy. Before you start there's a few things you might need to check. You might need the most recent version of the iOS software. That's the software that your iPhone uses. If you have an iPhone 4s, 5, 5c, 5s, 6 or above, you should be able to install the software that you need. To find out if you need to update your software simply go into Settings, General, Software Update and it will tell you if you need to update your iOS version. You may need to be connected to Wi-Fi before you start. Once you have updated your software or, if you do have the most recent version of iOS, simply go on to the App Store and search for Ergon Energy. The Ergon 24/7 app will appear. Click on install and the app will install. Once it’s installed on your phone, open it up. If you're a new user you will need to either create an account or you can log in with Facebook. If you're an existing user simply enter your username and password. Now that I'm logged in I'm able to use the Ergon 24/7 app. Here are some of the things you can do within the app. You can use the Outage Finder. This is the same as the Outage Finder on the website but it's available for use within the app. Search for your location, or your phone may recognise your current location. Apart from searching for network outages, you can report problems with the network. There are three different categories of network problems you can report. You can report faulty streetlights, you can report vegetation growth, or you can report damage to the network. Within these three broad categories there are more refined categories. So you can pinpoint exact damage to the network. Some of these categories will divert you to our Call Centre and you may be required to call Ergon. For most categories though, you can use the app to report the damage. When you report the damage you may be able to upload photos of the damage using your phone's camera. You'll also be able to pinpoint your location using the phone's GPS system. 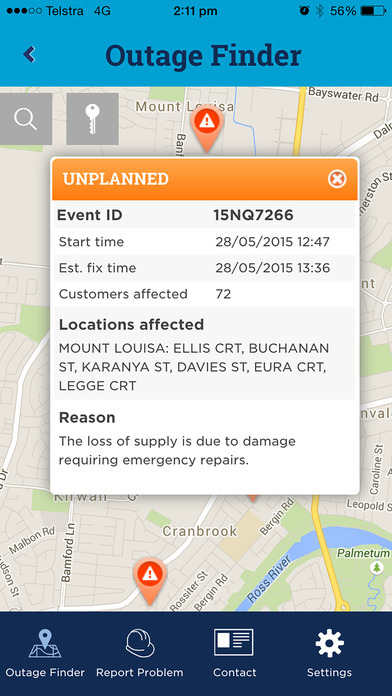 All this means it’s even easier to report damage to Ergon’s network. For us as an organisation, it means more data which will allow us to make better decisions. 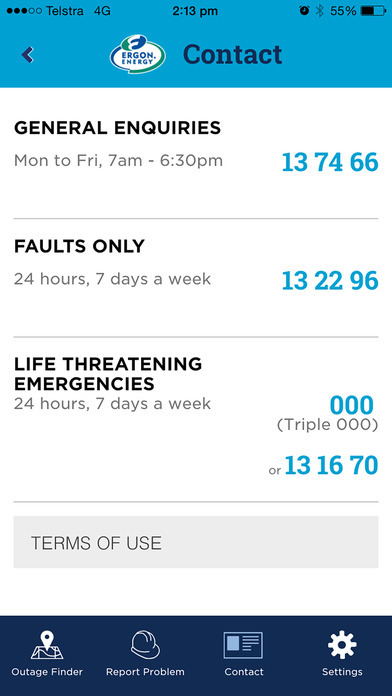 Hopefully this information will help you get up and running with Ergon’s 24/7 app. If you require more information just visit the location on your screen.